Their leafy, green and generally don’t take forever to grow, which is always a winner with the kids. I wouldn’t class them as hard to grow either, and they’re bursting with goodness. As the autumn nights start to really cool down and the day temps as well, you’ll see Asian greens flourishing. Don’t plant them too early or they could start to flower in the heat and keep your eye out for the pests who love munchin’ on our green like snails and slugs. Grab some heirloom seeds which you can start 4-6 weeks earlier. It’s a great way to extend your growing period and continue your supply over autumn. Plant a few seeds at a time so you don’t have too many. Find out more about seed raising here. 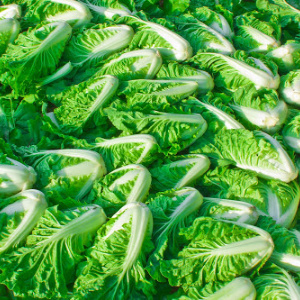 There are so many awesome varieties in Asian greens such as pak choi, bok choi, Chinese cabbage, Chinese broccoli and tatsoi. 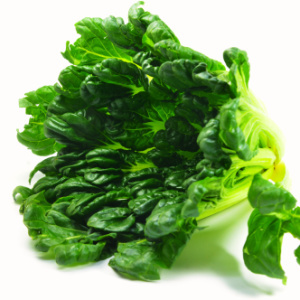 Nutrient-dense Asian leafy greens are rich in vitamin C, beta-carotene, fibre and many B vitamins. They even deliver high levels of calcium and iron. They really are an ideal crop for a family food garden. You can add them to stir-fries, eat them blanched or even munch down on them raw. So let’s choose some crops and start enjoying the green goodness. Only differentiated by their stem colour, these two are probably the most popular of the bunch. 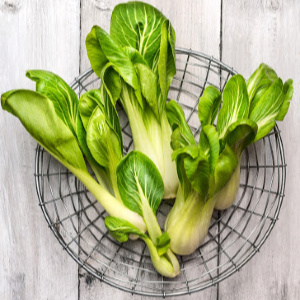 Bok choy is like the big brother in size, so you’re likely to get more. 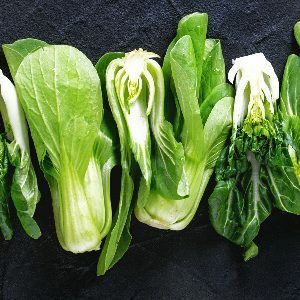 Bok choy has a white stem while pak choy’s stem is greener. 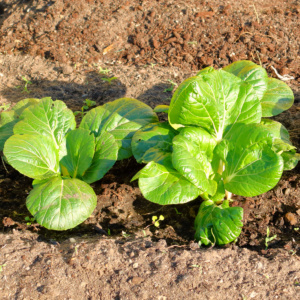 Also going by the name of wombok, Chinese cabbage is one of my favourite’s to grow in the cooler weather. It’s as versatile as regular cabbage but it grows quicker, tastes better and takes up less room. Looking similar to regular broccoli in appearance, Chinese broccoli seems like an easy name to remember for our western society. It’s another fast growing plant and it’s grown annually in Australia. 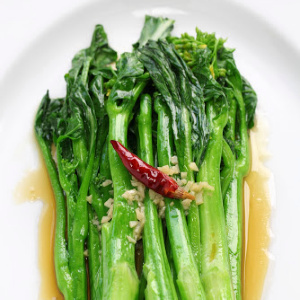 I love eating Chinese broccoli as a side dish with a dash of oyster sauce. 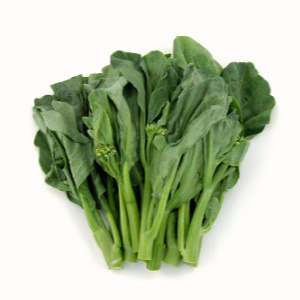 Tatsoi is also known as Chinese flat leaf cabbage and that’s exactly how I would describe it, like a flat cabbage. You can pick it early and enjoy it in a salad to add a tangy, peppery flavour. You can also grow tatsoi as a microgreen in a condensed environment. Position in full sun, but make sure it’s after the heat has passed. If you still have our Australian heat hitting your patch, simply choose a spot with part shade to help protect your crop. 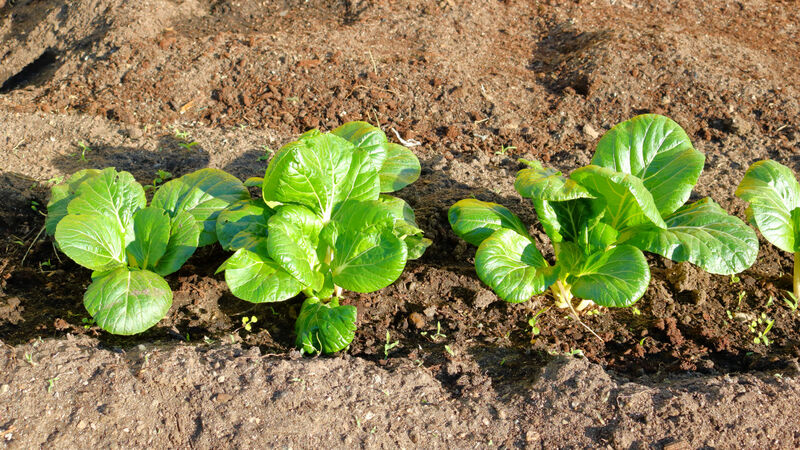 Prepare your soil so it’s rich in organic matter and pay attention to your spacing. You want to ensure adequate airflow for your patch of green goodness. 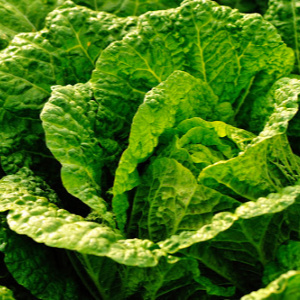 Like some other vegetables, Asian greens taste better and gather up intense nutrients when they are grown fast. Top your plants up with some organic fertiliser like worm castings and wee to boost them along during their growing stage. Another good tip is to sprinkle some Epsom salts into your watering can in the early days. They just love magnesium and you can definitely use this to help with seed germination as well. You’ll also need to keep the water up to them as they have a high content of moisture in their make-up. Harvesting will begin from around 8 weeks up to 12 weeks, depending on which crops you choose and your climate of course. Check out the planting guides which best match your climate. I’ve mentioned earlier on that slugs and snails love these crops, and it’s no wonder because they taste amazing. You’ll also have to keep your eye out for the white cabbage butterfly and cabbage moth (caterpillars) and even aphids don’t mind a nibble. If you’ll like to learn more about your food garden pests, click through here and read all about the ones you need to look out for.